German board developer congatec is now supporting the latest 64bit i.MX8 embedded processors from NXP on its Qseven and Smarc module standards. The i.MX8 brings the latest 64bit ARM Cortex A53 / A72 processor cores to the embedded market with up to four cores and high-performance graphics for up to four independent displays with low energy consumption. 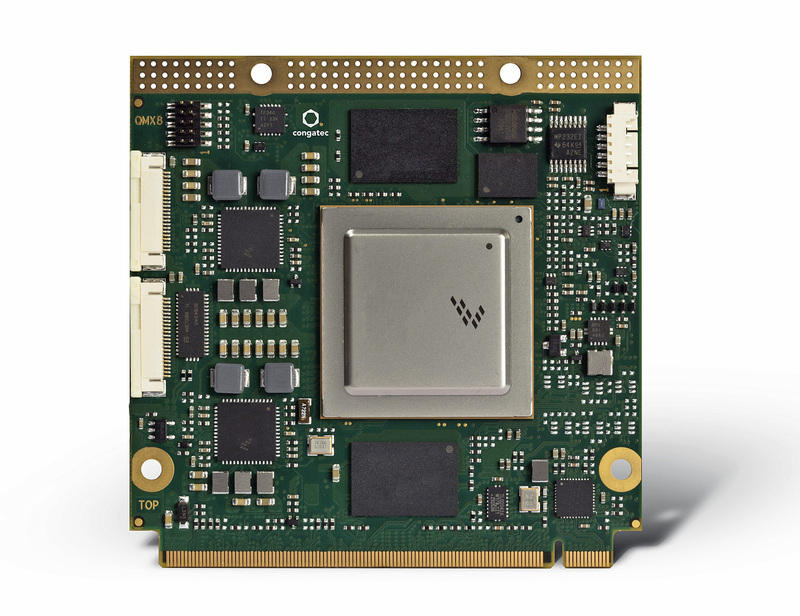 As a member of NXP's Early Access Program, the modules will be available in time with the production launch of the processor cores so that OEM customers can quickly develop and test new systems. Developers can start designing the carrier board for their applications now and will be able to use the modules from day one of the launch date. No other design strategy promises faster time-to-market and higher design security. The i.MX8 Qseven and Smarc modules are aimed at a wide range of industrial, stationary and in-vehicle applications as the modules are designed for the extended ambient temperature range from -40°C to +85°C, they can also be used in fleet systems for commercial vehicles or in infotainment applications in cabs, busses and trains as well as all the new electric and autonomous vehicles. "We see a strong increase in demand for ARM technologies in all low-power embedded segments, which we are in a perfect position to address with our Qseven and Smarc modules," said Martin Danzer, Director of Product Management at congatec. "With the hardware support for the virtualisation of the CPU and GPU cores as well as hardware-accelerated image and speech recognition, entirely new applications with innovative access control and user interface concepts are now conceivable, making the use of embedded ARM architecture even easier, more convenient and more versatile." "i.MX8 based Computer-on-Modules in the leading small form factor standards Qseven and Smarc enable developers to implement their projects with the shortest time to market and with very little NRE effort," said Steve Owen, Executive Vice President Global Sales at NXP. "With Computer-on-Modules, engineers can save minimum 50% and up to 90% time and NRE efforts compared to a full custom design. This modular approach is ideal for industrial batches as it significantly simplifies the use of ARM technologies. This opens new market segments for NXP's i.MX technology where developers traditionally employed x86 technology. When solution providers such as congatec also offer embedded design and manufacturing services, they are an ideal starting point for full-custom designs with particularly high production volumes." The first congatec modules and associated starter kits will be shown in March but starter kits with Qseven modules based on the current NXP i.MX6 processors are available to allow designers to switch to the new 64bit platform when the new modules are launched. The first batches will be limited so interested OEM customers should register now for the congatec i.MX8 Early Access Program.